Tasmania is surrounded by more than 350 outer islands. Migratory Right and Humpback Whales sail through forests of kelp while the world's tiniest penguins speed through the water like bullets. Tasmania is a scuba diver's paradise with pristine waters abundant in life. The Natural State is committed to natural preservation with more than 45,000 hectares of marine reserves. And with over 5,000 kilometres of coastline, Tasmania's colourful underwater wonderland is just waiting for you to explore. European settlers began to arrive on Tasmanian in the 1800's. With a rocky coastline and unpredictable weather, the Tasmanian island claimed many of these ships. These historical artifacts lay beautifully preserved at the bottom of some of Tasmania's best dive sites. Diving to these shipwrecks is the perfect way to blend a love of history with a sense of adventure. Most people associate Australia with tropical dive sites such as the Great Barrier Reef or Ningaloo Reef. And while Tasmania sits closer to Antarctica than these two tropical reefs, Tasmania offers a diving experience that is just as beautiful. Here you'll find shipwrecks, kelp forests and sea caves abundant with temperate-water life. The cool water provides plenty of food to support an array of sea creatures for your enjoyment. Water temperatures range from 15°C in the summer months between January and March. Temperatures drop to 11°C in the winter months from June to September. The minimum recommended diving suit thickness is 7 mm for comfort. While the water temperature is most comfortable in summer, visibility is better in winter. You'll achieve more than 40 metres of visibility during the winter months between June and September. Visibility can reach up to 12 metres during summer between January and March. While there are plenty of shallow water dives that can have you interacting with seals and dolphins, it is recommended that you are deep dive certified. Many of Tasmania's best diving sites have a seafloor depth of up to 40 metres. So, to get the most out of your Tasmanian diving experience, be sure to be deep dive certified before arriving on the island. Tasmania's two largest cities -- Hobart and Launceston -- have commercial airports connecting you to other Australian capitals. Depending on your departing city, you may be able to find a flight straight to Hobart. But there's another option that may be even more convenient. The Spirit of Tasmania ferry runs between Melbourne and the Tasmanian north coast town of Devonport. You can drive a car right onto the ferry and be on the Tasmanian island overnight. Sea caves are highly sought after by divers worldwide and they are relatively rare, but they are abundant in Tasmania. Massive caverns allow for easy swim-throughs and multiple passages can take you to an entirely different bay where a tour boat can scoop you up. Most Tasmanian sea caves feature abundant light pouring in from multiple passageways, meaning you'll never dive in the dark nor will you have to squeeze through tight hallways. And rocky bottoms guarantee visibility will be good as there is no silt or sand to kick up during your dive. You just get to suit up, sail through beautiful passageways covered in abundant sea life and pop out on the other end exhilarated. There are multiple shipwrecks around the Tasmanian island but none more popular or famous than the Nord. Back in 1915, it wrecked on an unmapped rock on its way through the Hippolyte Rocks. Carrying more than 12,000 cases of petroleum, this ship settled on the bottom nearly intact. And in winter, when visibility is good, sunlight often pours down to illuminate schools of fish flitting in and out of this massive tanker. The cool water temperatures and Antarctic current fill the water with plenty of food for all sorts of underwater life. None are more impressive than the invertebrates that cover deep sea walls. One of the most famous is the Yellow Zoanthid which can completely cover seawalls for as far as the eye can see. You'll also find massive schools of cool water fish as well as gigantic sponges in the depths. Seals are quite playful and can be a joy to dive with. 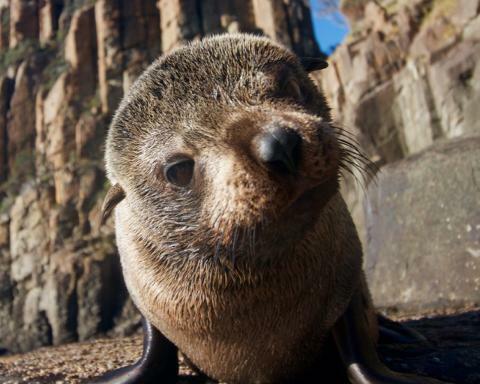 There are plenty of seal colonies dotting the eastern and southern coasts of Tasmania. And, if your really lucky, you'll experience the Blue Penguin darting through the water for a feed during the day. They also swim back to shore in formations called rafts at dusk. Right and Humpback Whales meander up and down the coastlines according to a migratory schedule. And dolphins are common in the crystal-clear waters off Tasmania as they chase the wakes of boats and play with shallow water divers. Wildlife encounters are never guaranteed, but they can make for the dive of a lifetime. The east coast of Tasmania is a diver's heaven. Crystal-clear waters sit on protected coasts and are absolutely teeming with wildlife. In one of the best places to dive on the east coast is the town of Bicheno. Here you'll find the world-famous Magic Garden which is a 38-metre wall absolutely covered in delicate marine life. Dolphins and seals can be seen swimming through its massive tunnels while whales sail through the waters in the distance. The Magic Garden sits in the Governor's Island Marine Reserve, which is one of the most beautiful dive sites in the entire continent. From Bicheno, you'll also have access to Paradise Reef and the deep dive of the Golden Bommies. Maria Island sits off the beautiful sandy shores of the east coast town of Orford. The island is surrounded by an incredible array of marine biodiversity and it is on full display at one of Tasmania's best dive sites. A 55-metre Hopper Barge named the Troy D was sunk in 2007 in order to create a reef. It worked resoundingly well. The wreck is now a beautiful and colourful reef that is absolutely dripping with life. From a stunning array of invertebrates to massive schools of fish, Maria Island is not to be missed. 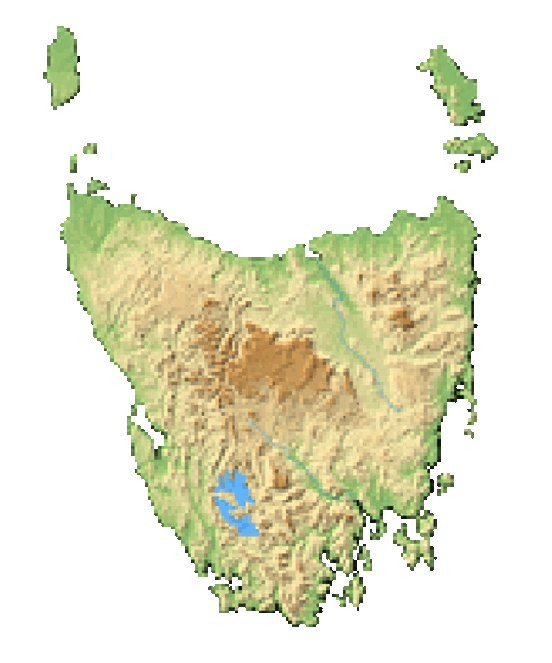 The Tasman Peninsula sits just about an hour to the southeast of Hobart. The drive to these dive sites is just as spectacular as the dives themselves. You'll navigate over Eaglehawk Neck, a small sliver of sand connecting the Tasman Peninsula to the mainland that is no more than 100 metres wide, to stunning geological features like the Tessellated Pavement, Tasman Arch and the Devil's Kitchen. You'll then get into the water to navigate towering kelp forests, underwater sea caves and colourful sponge gardens. 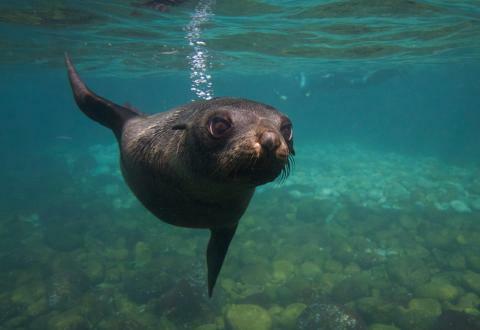 And you'll be able to swim alongside playful seals. Board the car ferry at Kettering to sail 15 minutes to Bruny Island. The southern edge of the island is protected as the South Bruny National Park and that's where you'll find towering dolerite cliffs. These cliffs cut deep into the ocean to create caverns and extensive overhangs. With migratory Right Whales off in the distance and Blue Penguins darting through the water, you'll submerge through thick kelp forests to explore massive sea caves. You'll find beautiful dives on the northwest coast at Rocky Cape National Park. With rolling hills covered in wildflowers off in the distance, you'll submerge to an underwater paradise. Massive barrel sponges, puffer fish, giant clams and colourful invertebrates wait for you on extensive reef systems. You'll even be able to scope Australia's rare yellow and white sea pens.